I was late discovering the I Love You, Yaya Handbook. Good thing they had one copy left in Fullybooked, Powerplant. I initially had second thoughts about buying the book because it looked like the browsing copy. (I hate wrinkly/crumpled book covers.) When I opened it, I even saw scribbles in the title page. WTF?!? "Oh, wait! 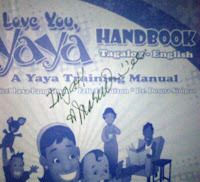 That's Maricel Laxa-Pangilinan's authograph. SOLD!" I bought it for P499. Since I am childless and don't need a yaya, I got it purely for research. This review is for you my dear readers. The book comes with 2 CDs. They contain the same subjects discussed during the I Love You, Yaya Training Seminars. You can use it to train your yayas at home. I listened to Disc 1 and all I can say is that I love Maricel's voice. She sounds so soothing and pleasant. It's a handbook for you and your yaya! If you want to see it first before investing your P499, you can borrow my copy. Oh yes please! May I borrow your copy? OOhhh. This looks really interesting. How can I borrow your copy? 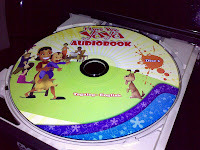 @Vicki - You want me to send you a clip from the CD? hi, just stumble here from witsandnuts. looks interesting. thank you for sharing this one. i think i need that book too. coz i am having a hard time in training my yaya. I didn't see your reply. How do we do this? Sending the clip part I mean. I'm the husband of someone presently working on the Handbook with our Yaya. Suffice it to say that, when we heard Felichi Pangilinan-Buizon talk about the Handbook during the recently conducted 2nd Philippine Homeschooling Conference, we were convicted to it. You may read our take about it at sidmacatol.com. HIGHLY RECOMMENDED. MUST READ FOR ALL MOTHERS, WITH OR WITHOUT YAYA. FIRST OF ITS KIND. SOMETHING PINOYS CAN BE REALLY PROUD OF.